MEXICO CITY, MEXICO (Saturday, September 3, 2016): Greaves Motorsport marked its return to the FIA World Endurance Championship with a strong performance today in Mexico City – scoring fifth place in the LM P2 class at the Autodromo Hermanos Rodriguez. The reigning European Le Mans Series champions returned to the FIA WEC this weekend for its first six hour WEC event since the end of 2013. Mexican veterans Roberto Gonzalez and Luis Diaz were joined this weekend by former Indy 500 pole winner Bruno Junqueira aboard the Nissan-powered Gibson 015S chassis which claimed ELMS championship honours last year. After starting sixth, Junqueira was hit on the opening lap and pushed to the back of the LM P2 pack, losing ground to his rivals on the opening lap. Junqueira, Gonzalez and Diaz kicked off a strong fightback which pushed them up as high as third in class before finish fifth at the chequered flag after six hours. The three drivers had to battle variable weather conditions with a number of rain showers striking the Mexico City circuit – forcing a switch to Dunlop intermediate rubber on a number of occasions throughout the race. Next up on the schedule for Greaves Motorsport is the upcoming round of the European Le Mans Series on September 25. “We had an eventful race. 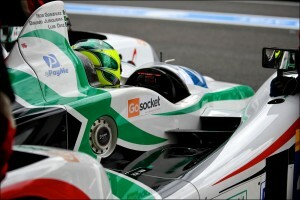 I’m very satisfied and all three drivers were excellent and had very good pace. “We were very unfortunate that Bruno got hit right at the start and really cost us a podium I think. If we hadn’t had lost a lot of places and fallen back to last place, I think we could have finished third. “Unfortunately I got hit on the start and ended up last. I managed to pass a couple of guys but we were struggling in terms of straight line speed but the car was very good in the corners. “So it was difficult to pass but I managed to recover some ground. “In the damp we were one of the best cars and we were up to third at one stage. “We ended up fifth and I am very happy. The car was very reliable and we had great pit stops with the team. “It was a tough race for us after Bruno got hit in the beginning of the race. “That cost us a little bit but I think in the end the team did a great job. “It was a challenging race in Mexico with weather playing havoc. All three drivers did a great job. They performed well in their stints, they coped well with the mixed conditions driving on intermediates and slick tyres and it was just unfortunate that Bruno got hit on the first lap which cost us 30 seconds at the start. “Also Luis had a small spin in the middle of the race. Without those two problems I think we could have finished on the podium which would have been our deserved position from today’s efforts.